A flashback to our unforgettable holiday in Thailand during Jun/ July last year. Tue 28: Visit Sr Gill; Dallas after thirty years! I was “Thai-ED”and needed to sleep. It was our second last night on The Island. Saturday morning, and it was Market Day in Phuket Town. That is where the group was headed. All except me, that is. I decided that I had had enough shopping and would remain behind at the hotel. A relaxing day at the pool and on the beach … but the rain continued and so, there were brief moments in the sun at the pool for me interspersed with a number of lazy naps in our hotel room. The Poncho Brigade left in the rain for Phuket Town round about noon. 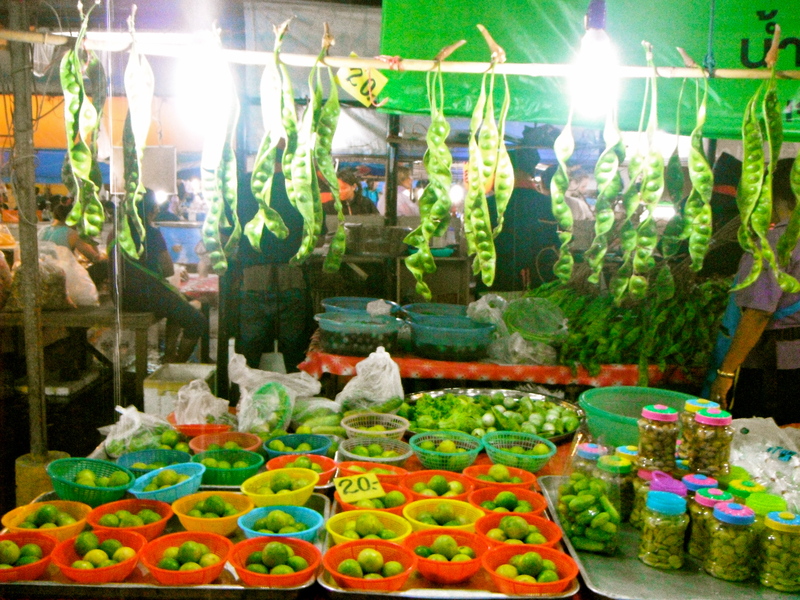 They visited some malls and the Phuket Weekly Saturday Market – shopped ‘til they dropped! The last of the Bhats had to be spent before our return to SA on the next day (Sunday). Saturday evening, we celebrated Phill’s birthday in Thai style at the restaurant next door to our hotel. Originally, we planned to go through to Kata Beach – a more vibrant area – but I think the bums were tired from all the scootering around the shopping areas of Phuket! So, it was simply a short walk up the water-logged road to our local neighbourhood Thai restaurant. Besides Phill’s birthday, we also celebrated our last dinner together in the East. The rain continued with brief spells of intermittent sunshine. In fact, for me, the weather conditions were far more comfortable during the rainy periods. Despite the temperature being high, the humidity level would drop a bit and make the outdoor conditions far more tolerable. The plan for Friday morning was to spend time on the beach – that rained out. Instead, I had a foot massage, a pedicure and … eventually a full Thai massage in the hotel lobby area! Pera and I had booked to see the Fantasea Show at a venue just north of Patong Beach. The rest of the group planned to return to Patong to commence the early celebration of Phillip’s 17th birthday on the next day (Saturday 7 July). They had made arrangements with the friends they had made at the Bar Big Bang to braai and party the night away – and by now there was also a SA flag hanging there that had been procured somewhere in Phuket. We were collected at the hotel by a taxi at about 17h30 and made two other stops to collect more patrons, arriving at the Fantasea complex well in time for the show which was due to commence at 19h00. 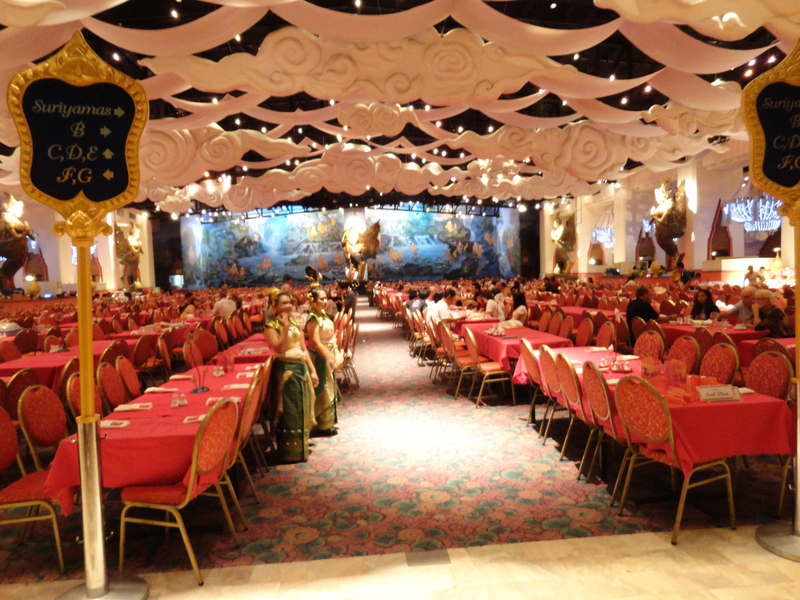 They had two sessions that evening: one group of 3 000 people sit down and have supper together in an enormous dining hall (Thai Buffet, of course!) whilst another group of 3 000 people watch the show (that was our group). The groups swap at 21h00 when our group went to supper and the first supper group go and watch the show! The logistics of planning all this is as admirable as the show itself! Hundreds of taxis arrive at the venue bringing people from every hotel on the Island. You are swiftly ushered to one of a number of queues to collect your tickets. In our case, where we were kept waiting for a few seconds because the person in front of us experienced a delay with his credit card, we were immediately ushered to the VIP queue, apologised to most profusely and given our tickets immediately. Then each person has to hand in the camera and cell phone as photography is strictly prohibited. Imagine the logistics involved in collecting 3000 peoples’ recording devices but, again, all of this happens in minutes! The show itself is a one and a half hour extravaganza of music, song, dance, prose, acrobatics, animals (including elephants, of course), magic, illusion, colour, laser, lights … a showcase of all that is Thai using the showcase of each and every media method that one can imagine. After the show, in a matter of minutes, you are reunited with your valuables, and then we headed off to the dining hall – another example of Thai cuisine united with Thai logistics. And then at 22h30, the taxi was waiting for us at Bay no 8, as arranged. We had originally planned to join the others at Big Bang in Patong to see in Phill’s birthday. However, we opted to be returned straight back to our hotel, the Katathani, in Kata Noi. I was “Thai-ED”and “neED- ED” to sleep. It was our second last night on The Island. Sitting in coffee room waiting to go scootering!!! Bought ponchos to depart in the rain! 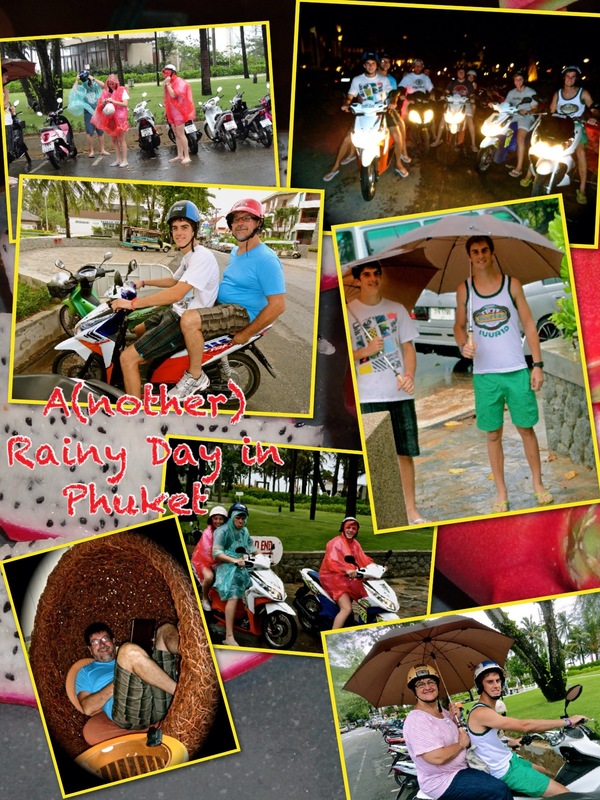 Left at one for Phuket Town on scooters in pouring rain … the Poncho People! AlgoAFM broadcast from room 3:30 (10h30 in SA) – A happy ending! I made the above notes (and those of Wed 4 July and Thurs 5 July) on Thursday 5 July. They were the only notes I made during the trip and up until now I have been writing as much as my memory will allow me to do. We had planned to spend five nights at the Amari Coral Beach Hotel on Patong Beach and then a further five nights at the Katathani Pukhet Beach Resort at the Kata Noi Beach. The resort calls itself the “Shores of Serenity” and it is only about ten kilometres further south from Patong Beach on the western Andaman Sea coastline of Phuket Island. For those readers familiar with Port Elizabeth, it would be something like moving down the coast from the bustle of Kings Beach to the more sedate Cape Recife. On the Cape Peninsula it would be like moving from Clifton’s Fourth Beach to Kommetjie! Katathani is a beautiful large holiday resort and offers daily activities such as pool volleyball, aqua aerobics, water polo, Thai boxing classes, Thai cooking classes, fruit and vegetable carving, walks, dance aerobics, Thai massages, yoga and personal trainers. The resort consists of two sections – a larger one on the beach and a smaller section at the side and facing but not quite on the beach. We were in this part, so we lost our immediate waterfront rooms that we had become accustomed to at the Amari and the sound of the waves crashing on the beach below us. But that water sound that we lost was replaced by another water sound – it started raining heavily on Tuesday afternoon and did so intermittently until we left on Sunday. It was warm rain falling from the sky as if someone was just standing there regularly squeezing out a sponge. It curtailed our beach visits somewhat, but for the rest we just had to make do with activities in the rain – even as much as a busy game of waterpolo in the hotel pool in drenching rain when at times it was difficult to see in front of you! Because we checked in late, the hotel gave us vouchers which entitled our family to free Thai massages. We made use of them on Wednesday afternoon. For the rest, Tuesday followed the activities as detailed above. Swim and sleep to end our rest day, and to prepare for an early start for our boat trip to Phi-Phi on Monday! One of the excursions that we all wanted to do was a boat trip to Phi Phi Islands – the location at which the Leonardo de Caprio movie “The Beach” was filmed and often the postcard pictures that get used to advertise Thailand. There are actually two islands – Phi Phi Ley and Phi Phi Don. 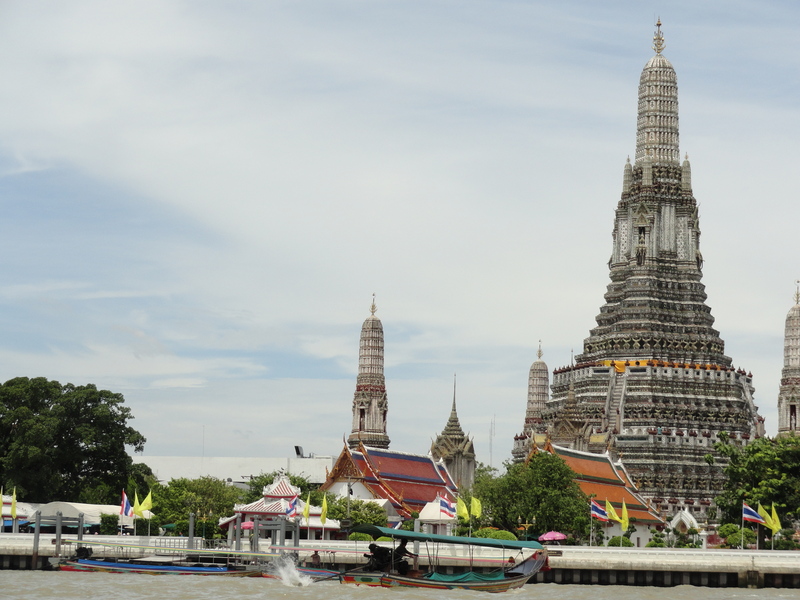 Tickets for these various excursions – besides being able to arrange them from home – are available all over Thailand, from Travel Agents through just about any of the shops to “sidewalk sellers”. The prices vary considerably and depend on number of people travelling, the add-ons and add-ins that one requires (like pick-ups at hotels, meals, type of boat, snorkelling, equipment, etc etc) and of course, how good one’s negotiating skills and endurance and perseverance are. Alison and Pera had purchased our tickets at a sidewalk seller at Patong Beach on the Sunday. We were to be collected at the hotel at 7h30, transferred to the harbour at Phuket Town, taken to Phi Phi on a speedboat (no more than 50 people! ), stop at a few places and eventually returned to our hotel at 17h00 that afternoon – all at the price of BHT900 per person (just less than R300). And the tour operator through his agent commanded “Let there be Phi Phi Tour”. Evening passed and morning came – it was Monday and there was tour. And we were very pleased with what we saw and it was good! We were picked up (again punctually!) and went eastwards across Phuket Island, through Phuket Town to the harbour. There we were given an orientation programme by our tour guide, a flamboyant ladybird, as to the day’s events, safety etc and sea-sick pills for the hour long trip over the Andaman Sea to Phi Phi Ley. The sea was not calm, as I believe it can be, and it was not rough, as I believe it can get. But we did bump a bit and on the way there and we did experience our first rain shower of the trip. Soon we turned the corner into Maya Bay and expecting a lonely beautiful tropical beach, I was quite shocked when I saw the hundreds of people on The Beach and the numerous boats offloading more and more! As some left, more arrived. 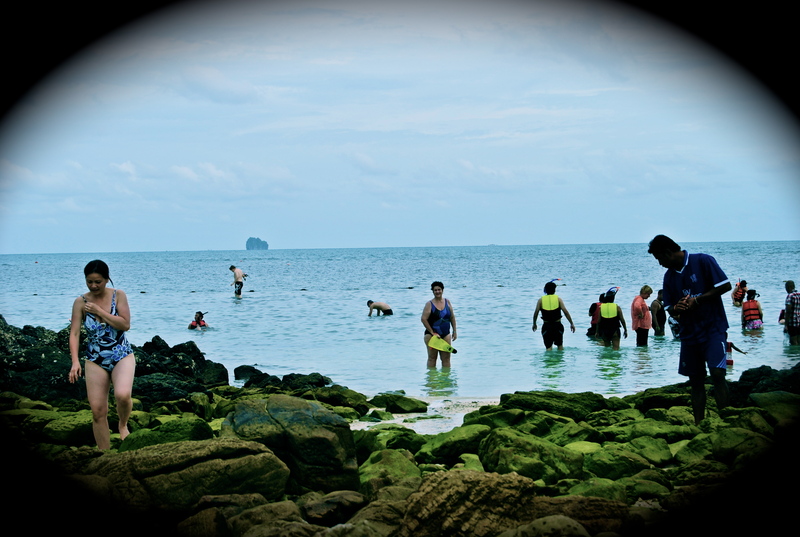 We swam for a while (and dodged boats) before we departed to Viking Cave, Monkey Beach and Phi Phi Don Island. After lunch on Phi Phi Don Island, we snorkelled and then left for Khai Island. The boys were a bit disappointed that we did not find the 20m cliff that Mr Rory Duncan, their rugby coach, had challenged them to jump off! Maybe next time! We had about an hour to snorkel on Khai, swim or just to gape at the hundreds of people who were lying on the beach under a myriad of umbrellas. Then we headed back to Phuket Town and onwards back to the Hotel in Patong City. We were a bit bumpier for the boat ride but it had been so well worth it. What an experience! A swim in the hotel pool was followed by the obligatory nap, and then we had supper at the hotel. For some or other reason, still not quite known to me, we were given “apology” complimentary tickets for hotel dinner (which are normally much more expensive than meals obtainable at restaurants). The Bryants went to town for supper (Subai Subai!) and we had dinner “in style” in the diningroom overlooking Patong Bay. There was just one other couple there and we were joined by an Aussie who was travelling by himself and who I had met earlier in the pool. Dinner came complete with an evening of Thai entertainment (spot the “lady boys”!) and a drinks bill for a round of drinks that was far more expensive than had we gone for a meal and two rounds of drinks on the town!! We were very “Thai-ED” when, after the usual late night swim, we eventually went to bed and drifted off to sleep. 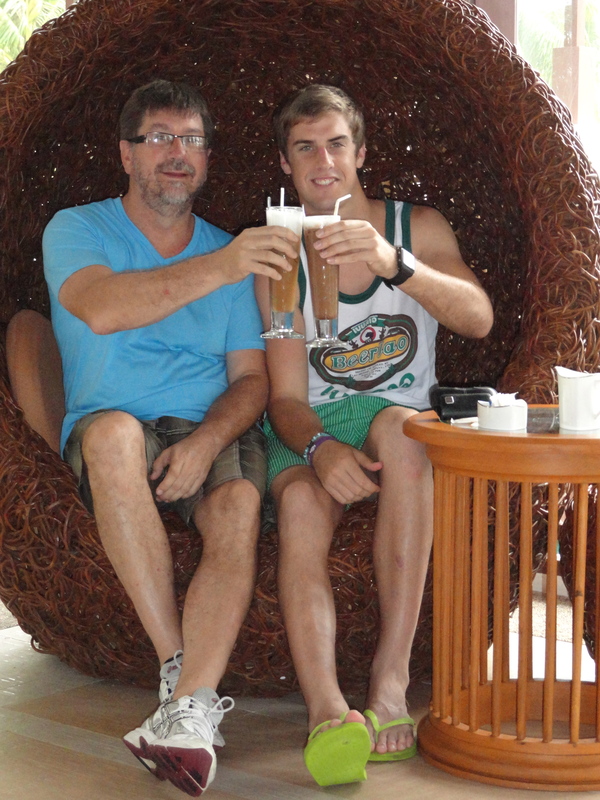 Tuesday, the next morning, would see us having to move to our next hotel at Kata Noi Beach.